Our group uses single-molecule optical microscopy to study fundamental interactions between proteins and nucleic acids - we literally watch individual protein molecules or protein complexes as they interact with their DNA substrates. Our overall goal is to reveal the molecular mechanisms that cells use to repair, maintain, and decode their genetic information. This research combines aspects of biochemistry, physics, and nanoscale technology to answer questions about complex biological problems that simply can not be addressed through traditional biochemical approaches. The primary advantages of our approaches are that we can actually see what proteins are bound to DNA, where they are bound, how they move, and how they influence other components of the system - all in real-time, at the level of a single reaction. Our research program is focused on studying the regulation and activity of proteins that are involved in repairing damaged chromosomes. We are particularly interested in determining the physical basis for the mechanisms that proteins use to survey DNA molecules for damage and initiate repair processes, and how these initial steps are coordinated with downstream events that lead to completion of repair. As part of our work, we are also actively pursuing the development of novel experimental tools that can be used to facilitate the study of single biochemical reactions. In particular, we are applying techniques derived from nanotechnology to our biological research, and using nano- and micro-scale engineering to facilitate the development of new, robust experimental platforms that enable "high throughput" single molecule imaging. One of the least appreciated aspects of TIRFM-based biochemistry is the difficulty of obtaining statistically relevant information from experiments designed to monitor the progress of individual biochemical reactions. This is especially difficult when using relatively complex, long DNA molecules such as those needed to study complex aspects of DNA repair. 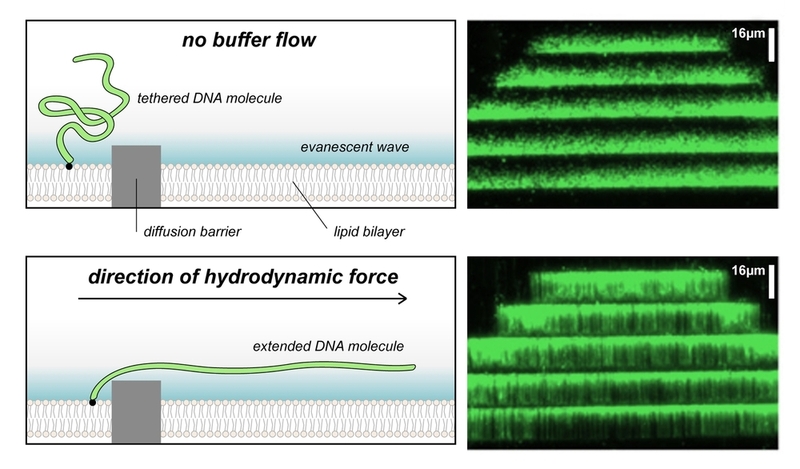 To overcome this problem we are developing new technologies that use fluid lipid bilayers to render surfaces inert to biological molecules and combine this with micro- and nano-scale materials engineering, which will enable us to construct parallel arrays containing hundreds of individual DNA molecules with user-defined positions, orientations, tensions, and topologies. These DNA arrays will allow parallel processing of hundreds, or possibly thousands, of individual protein-nucleic acid interactions in a single TIRFM experiment and will serve as an incredibly powerful tool for single-molecule research.